Arnaud started diving in 1984. He studied Archaeology at the Sorbonne and then took a Master’s degree in archaeology at the University of Rennes, specializing in naval construction. 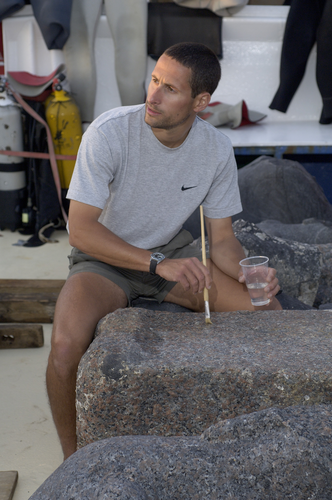 When called-up for his military service, he was able to use this time working with Georges Brocot for DRASM (Direction des recherches archéologiques sous-marine) in marine archaeology in rivers and lakes in France. At these sites they worked on remains from two different periods, Neolithic and Bronze Age. Some were habitation sites near the lake edges, with wood and organic materials still preserved. In 1986, he was studying and working in land archaeology but because he loved diving and archaeology, it occurred to him to combine the two. He finds the amount of information that can be learned about ancient cultures from archaeology very interesting. In 2007, together with colleagues, he created Paleotime, a company accredited by the French government for preventative archaeology. Paleotime specializes in all periods of Prehistory (Paleolithic, Mesolithic, Neolithic) and works throughout French national territory.